For the first decade or so of my life I was what I like to call a selective eater. I was picky and choosy and however which way you sliced it – it was a closed case. There was no going near certain foods. End of discussion. Today I am a changed woman. I realize that I missed out on a lot of good meals in the 80s and 90s and I need to make up for lost time. Almost nothing is off-limits. Give me a plate and I will sample and devour the contents with joy. The exception being an overripe tomato. No matter how much I try it is just the one food I can not rally behind being delicious. But rewind the clock to 1994. That was the year I subsisted entirely on cottage cheese sprinkled with goldfish crackers (don’t knock it until you try it) and my Dad’s homemade mac and cheese. I loathed salad or anything from a garden and good luck trying to get me to sample something really wild and crazy like a quiche! My selective-ness was made all the more apparent at family gatherings where I was up against other children, namely my three male cousins who would have eaten a car tire had it been grilled and slathered with barbecue sauce. Even from a young age they ate pretty much everything. While I was busy making sure my plain mashed potatoes were not in any way touching the chicken tenders which with they were forced to share the plate, my cousins were cracking crab legs with glee and picking out the tender meat from their high chairs. The granddaddy meal of them all – Thanksgiving – was that special time once a year that I had to come face-to-face with my ultimate childhood nemesis: The pumpkin pie. I could not wrap my 10-year old brain around why any self-respecting adult would consume a puréed vegetable and pass it off as a dessert. Quelle horreur!! But oh golly, what a few years of adult wisdom do make. These days I have to fight for my annual slice and I cherish every bite of pumpkin custard goodness. Which brings me to my next point that this time every year the “jazzy, new, fresh-twist” Thanksgiving menus start to roll out and they always tend to nix the pumpkin pie and replace the dessert finale with exactly the opposite. When has a slice of pie ever been a pecan-crusted cream cheese pumpkin roll? Never. Now I am not trying to pull a fast one with this recipe and change up your big day dessert repertoire. These bars are meant to fill the gap. That period of the year that starts off with pumpkin cookies, then segues into that time right about now when you just want one slice of pumpkin goodness but you can’t bring yourself to make a whole pie yet. They are what you want to bring to a fall-time gathering to get everyone excited for pie. Pecan shortbread-crusted pumpkin pie bites are perfect for that Friendsgiving celebration that you may be going to soon before heading home to share the real deal meal with family. But let’s talk burnt sugar for a minute. 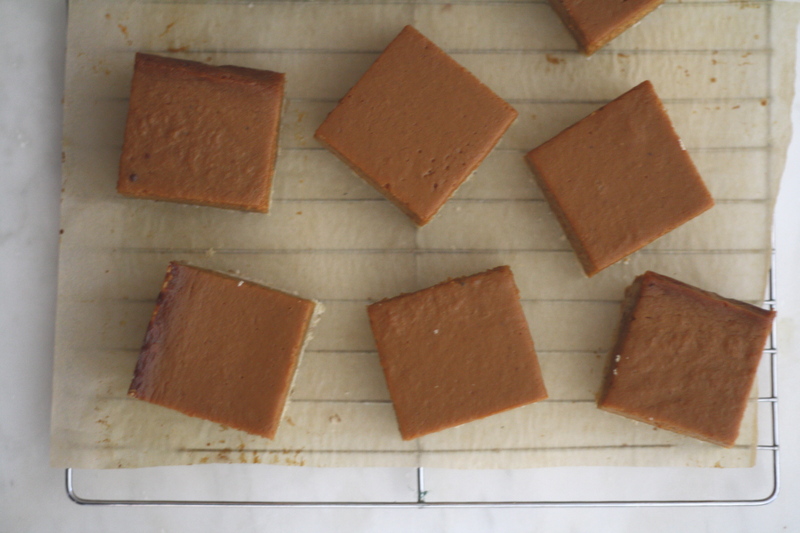 Burnt sugar is the base for these squares. You know things are going to be good when caramel is involved and these bars are good times in the way that if pecans, caramel, pumpkin and shortbread were all best friends and went out for happy hour. Scratch-made caramel can be scary stuff because it sputtered and spits and generally makes you feel like you are doing something wrong. 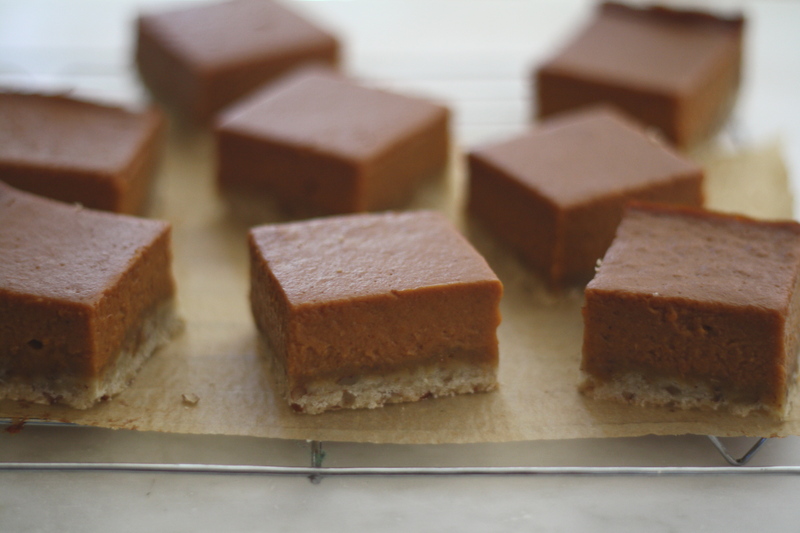 But making caramel can also make you feel like a wizard, and any random Wednesday that I get to feel like a wizard is fine by me, especially when the result is these festively fall pumpkin pie bars. 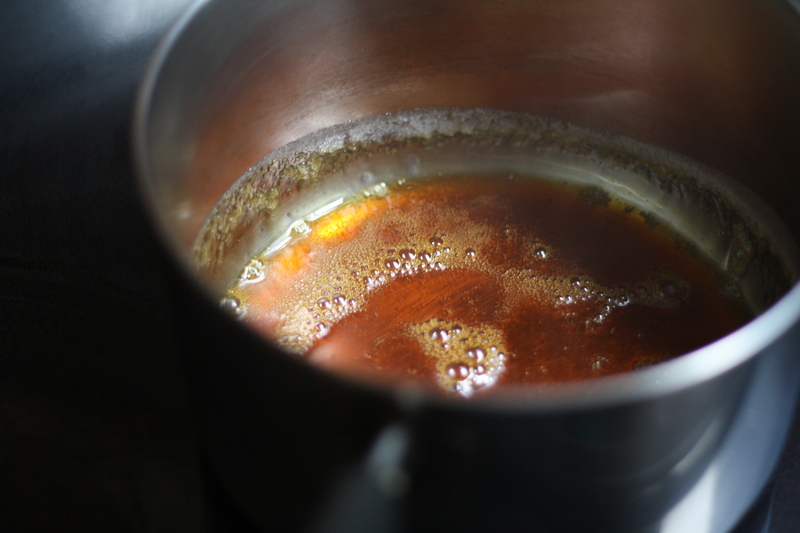 Caramel-making requires a bit of planning so prepare everything before you begin: Preheat oven to 350. Butter an 8 x 8 pan then line with two sheets of overlapping parchment and set aside. 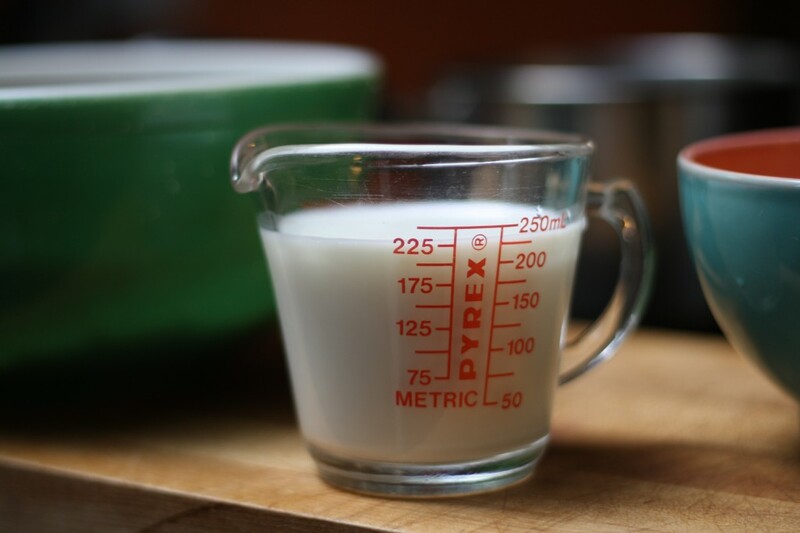 Measure out the milk and set aside. Whisk together pumpkin, sugar, spices and vanilla in a medium bowl and set aside. Whisk together eggs in a small bowl and set aside. 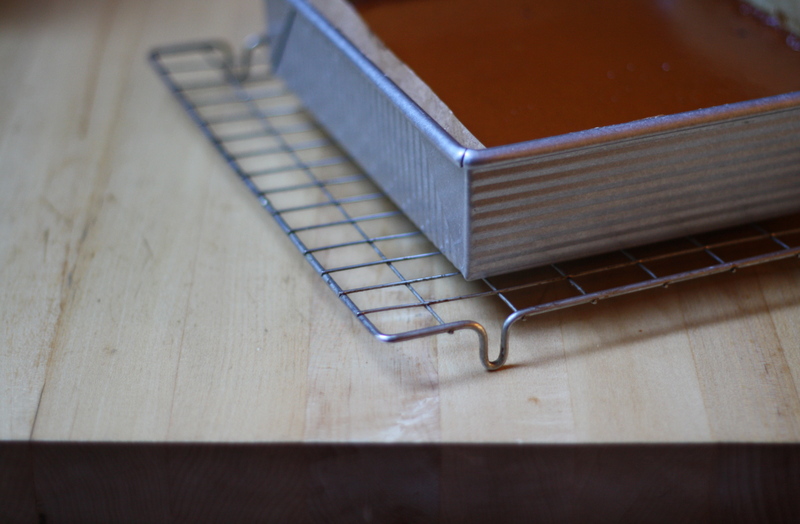 Have a wire cooling rack at the ready. 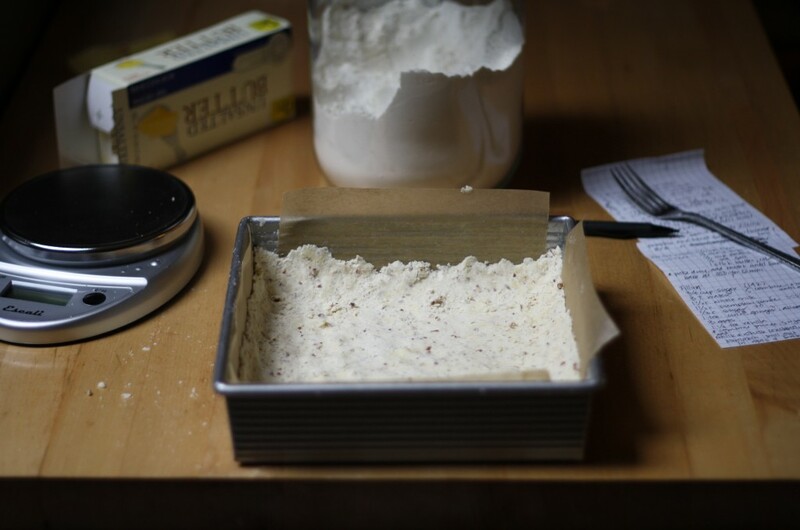 Make the crust: In a medium bowl whisk together flour, powdered sugar, finely chopped pecans, and salt. Add the butter and use your fingers to rub the cubes into the flour mixture until a dough begins to form and the mixture holds together when pressed. You can also pulse together the flour, powdered sugar, whole pecans halves and salt in a food processor until the nuts are finely chopped, then add the butter and pulse until combined. Press the crumbs evenly over the bottom and up the sides of the prepared pan. It may be a little crumbly but don’t fret, it will hold together. Bake the crust for 15 minutes. While the crust is baking make the filling: Combine the sugar and water in a large, heavy pot and tilt the pan until the sugar is wet. Heat the mixture over medium high heat, swirling occasionally. It will begin to bubble. Keep a close eye and swirl the pan often. It will begin to turn an amber color then quickly start to deepen. When you get to this point turn down the heat and remove the pan from the flame, grab a whisk, and prepare for the sputtering ahead! 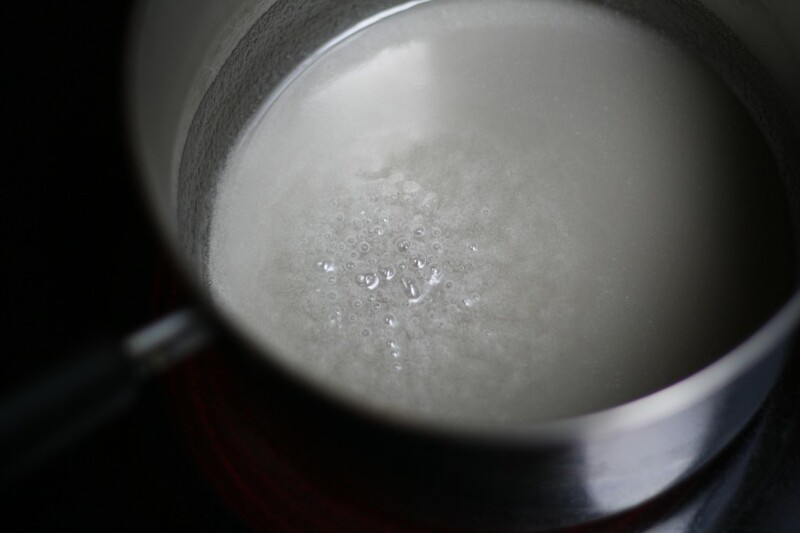 Add a splash of the milk to the burnt sugar. It will sputter and splatter so be careful. Quickly whisk to combine then – continuing to whisk constantly – add the rest of the milk to the caramel. 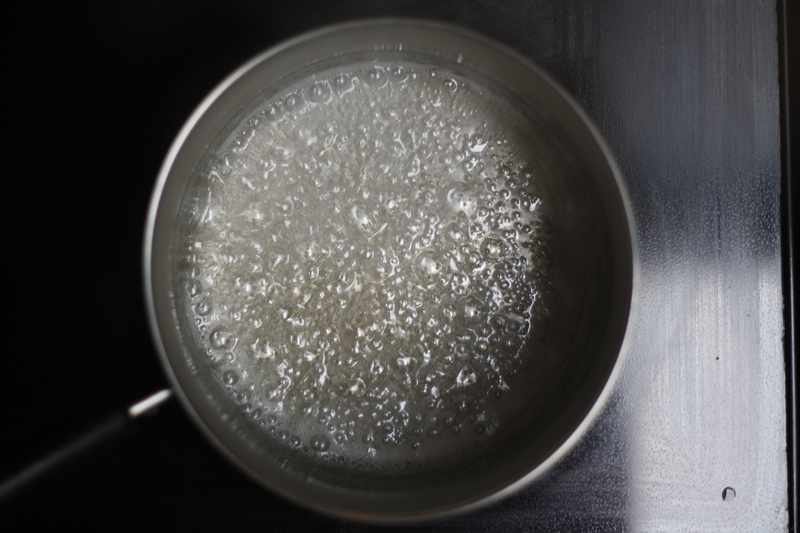 Return the pan to a medium low heat and whisk in the pumpkin mixture until smooth and stir until it has thickened slightly. With one hand re-whisk the eggs and with the other, slowly pour a small amount of the warm pumpkin mixture into the eggs. This is called tempering and prevents the custard from turning to scrambled eggs. Add the tempered egg/pumpkin mixture back to pot and whisk until the filling is smooth and well-combined or about 2 minutes. Bring it all together and assemble the bars: Somewhere along here your timer should have gone off to alert you about the crust, and it is just hanging out and cooling on the rack. Pour the filling over the warm crust and return to the oven. Bake for 30-35 minutes or until the middle no longer jiggles. Let cool completely before removing from the pan, then slice and serve. Serve at chilled or at room-temperature, preferably with a dollop of bourbon whipped cream. Store bars in the refrigerator for several days. *Wondering what to do with that little bit of pumpkin left in the can? Make a batch of boozy toasted marshmallow pumpkin milkshakes of course! These are so pretty! I absolutely love the burnt sugar idea. Mmmm. What a great idea with the burnt sugar base! I like this approach. I would have never thought of burnt sugar as a base. I know what you mean about how making caramel can just make you feel like everything is going the opposite if the way you think it should. To be honest, I’m still a little terrified of the stuff. But for these, I might be willing to try again. You can’t go wrong with pumpkin and shortbread! I like the way you think. Oh hi I need these right now. What a grown-up Thanksgiving dessert! Gorgeous! I think I’m going to need a pan. Or two. These bars sound amazing! Get in my face, all the pumpkin. This looks absolutely amazing! I definitely want to try this recipe. I just found your blog and I’m going to add it to my RSS feed. I love your honesty and photos. I can definitely relate with your story. I was super picky as a kid and now I realize what I have missed out on and love to try just about anything! I am in love! These look absolutely amazing. This gives me an idea to make burnt sugar pumpkin ice cream… The boozy pumpkin shakes sound awesome! These pumpkin bars are the best I’ve ever made. The pumpkin was not too sweet, not too heavy. The shortbread was perfect and not sweet at all. I ate two of them when they were still warm; I’m making them for Thanksgiving. While the recipe might appear challenging all the work is in the prep; the cooking goes quickly. 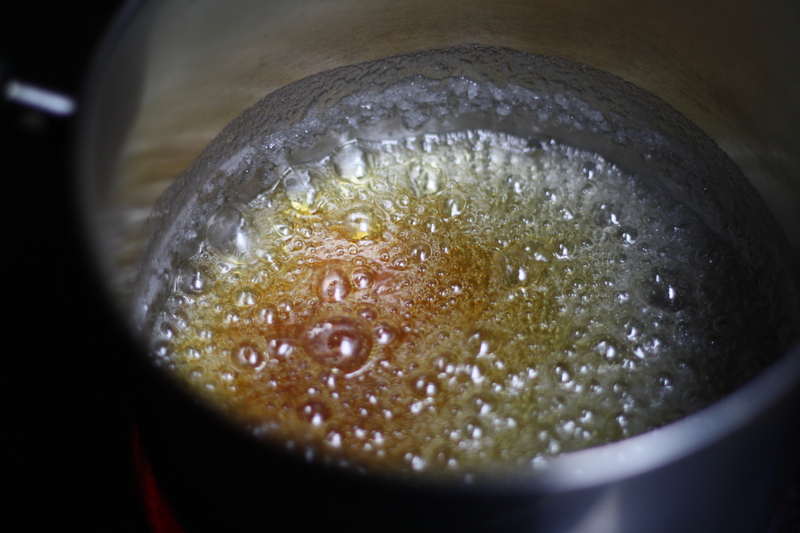 Pay close attention while boiling the sugar. The first time I got distracted and ended up with a smokey kitchen and a pan of black stuff. I’m so happy to hear they were a success! Happy T-day baking! Omg, those pumpkin and burnt sugar shortbread bars make me want to cry My little girl also just walked by and was drooling over it! I made these for Thanksgiving and they turned out awesome, but I had a few problems along the way I wanted to ask about..
Once I got everything done and put it into the oven is where my question comes in. Your recipe says it should take 30 mins to bake.. I finally took it out of the oven after 1 hr 45 min.. and it still wasn’t completely done in the middle… What do you think went wrong? I know my oven is fine because I did pumpkin pie in it right before this.. I’m thinking maybe elevation? I’m in Utah… Any thoughts would be great! Hi Crystal! I’m happy to hear that the photos helped with the burnt sugar base. I think that the elevation is definitely a factor in why they took so long to set since I baked them at an elevation of about 300 feet. Perhaps the next time you could add another egg (or yolk) which will help to firm up the custard a bit. It also could be due to that moisture content in pumpkin puree varies. Hope this helps! Happy baking! I made these for a dinner party I had and they were delicious! The recipe is perfect and they are simple to make. My guests were very impressed. Yay! I’m so happy to hear they were a hit!